I first saw this knife in Garden & Gun's recent winter issue as it won the coveted Made in the South Awards for 2011. I figured I've done enough soap, manbags and skin care products lately, so it was time to get back to the basics and showcase an item that any man can appreciate. 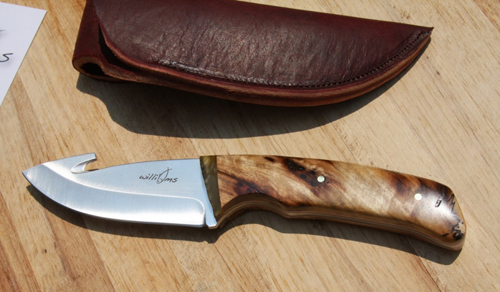 This is the Edisto Oyster knife from Williams Knife Co. of Greenville, South Carolina. 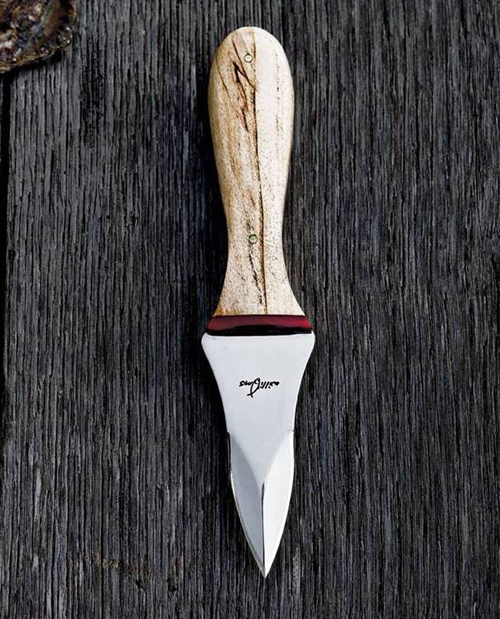 Created by Chris Williams, the knife has won accolades nationwide for its funtionality and craftsmanship. It's also distinctly Southern, able to open up the most stubborn and small oysters of the Carolina Lowcountry. It took many years for Chris to get this knife exactly how he wanted. As he shared, "It has to have leverage down the spine of the blade as well as through the body because you're twisting and turning." From the top, these are the Coosawatchie, Savannah and Coosaw knives. (All of Chris' knives are named after rivers and creeks in South Carolina.) 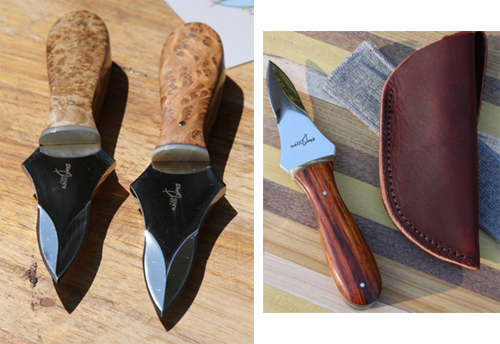 They are hunting and skinning style knives, as well as all purpose knives. As Chris shared with me, "I have folks from plantation managers who work with game on a daily basis that carry these knives to those who simply carry them for everyday chores." Even though Chris says his knives are "a tool first and a piece of art second," I can't help but admire the time and care put into making these. The handles are made of mother of pearl, abalone and various types of bone and antlers. And all of the knife sheaths are hand sewn using genuine leather that can be personalized upon request. Chirs, "The Chechessee is a standard trout fillet that is commonly used for small inshore species fish such as the speckled trout, redfish, flounder, etc... It's equally at home in the kitchen as a great slicing and preparing blade."